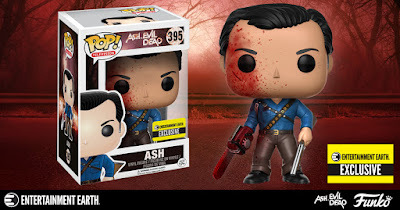 The Blot Says...: Ash vs Evil Dead Bloody Ash Pop! Figure by Funko – An Entertainment Earth Exclusive! 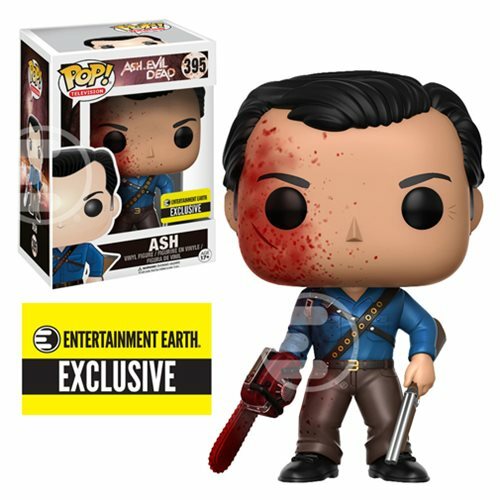 Ash vs Evil Dead Bloody Ash Pop! Figure by Funko – An Entertainment Earth Exclusive! Entertainment Earth has teamed up with Funko once again to release a killer new retailer exclusive Pop! vinyl figure! Based on one of The Blot’s favorite TV shows, the Entertainment Earth Exclusive Ash vs Evil Dead Bloody Ash Pop! depicts everyone’s favorite middle-aged S-mart stock boy fresh from a fight with the evil Deadites. With his chainsaw hand firmly in place and shotgun at the ready, Bruce Campbell’s chauvinistic charmer has just been through yet another bloody battle. Fans of this iconic B-movie cult franchise will definitely want to get their hands on this Bloody Variant Ash! The Entertainment Earth Exclusive Ash vs Evil Dead Bloody Ash Pop! Vinyl Figure stands 3.75” tall, features one point of articulation and comes packaged in a full color displayable window box. This retailer exclusive figure can be pre-ordered now at Entertainment Earth for $12.99 here.